It seems like we’ve gone through a time warp this past month. With the Jonas Brothers making a comeback, it’s left us all wondering what major flashback we’ll be experiencing next. Miley Cyrus is adding to that nostalgia—she’s been posting tons of throwback photos in honor of Women’s History Month, featuring classic moments of young Demi Lovato, Taylor Swift, Selena Gomez, and much more. We can’t help but reminisce on those good ol’ days when the worst thing we had to worry about was if we were rocking silly bandz. While the late 2000s might have been cringe-filled for some of us, we can’t help but remember it fondly. We’re taking a trip back to the days of Hannah Montana, T-Swizzle’s ‘Teardrops on My Guitar,” and High School Musical. Here’s a list of some of our fondest memories that we hope takes you all the way back to those middle school days. Remember when Miley Cyrus and Nick Jonas dated? And then broke up? And then Miley wrote this devastatingly heart-wrenching, typical high school anthem where she listed all the things she hated about Nick and the no. 1 thing was how she couldn’t hate him? Yeah, we do too. It seems like just yesterday T-Swift was topping the charts with ‘Love Story’ from her second album ‘Fearless.’ She was just 19 when it was released now she’s a soon-to-be-thirty-year-old who’s just finished a sold out world stadium tour. We’ll go listen to Taylor’s whole discography while trying to forget how old this make us all feel. We couldn’t create this list without mentioning Hannah Montana, probably the ultimate cult-classic television show. It left us all wondering: why couldn’t they tell Miley and Hannah apart? But the movie gave us Grammy-deserving music—we’re all in agreement ‘Hoedown Throwdown’ and ‘The Climb’ rightfully earned itself a place as one of the best songs ever made, right? We’re steering away from the Disney crew and diving into Nickelodeon’s Victorious. Before Ariana Grande was a mega-superstar, she played ditsy Cat on one of the network’s hottest shows. The comedy gave us jam after jam and catapulted the lives of its actors. And the great news is, they’re all still besties. Most of them recently starred alongside Ariana in her ‘thank u, next’ music video. When Selena Gomez and Taylor Swift both dated a Jonas brother at the same time. Everyone remembers Selena and Nick and Taylor and Joe. In 2008, they were the infamous teen couples who swept through young Hollywood and made all our teen hearts soar. 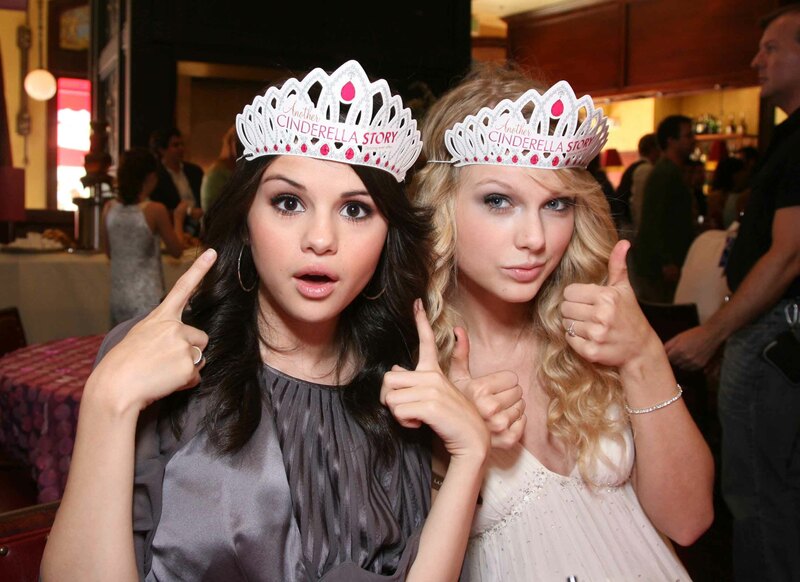 While they both ended in broken hearts and breakup anthems, Selena revealed that’s how they became best friends. ‘It was amazing, because [Taylor] was the girl with the big curly hair and all the bracelets and the cowboy boots. And I was definitely up-and-coming and we just clicked,” says Selena. See? The end of young love isn’t all bad. Miley didn’t mention this in her throwback frenzy but we feel like it’s necessary. High School Musical was the other Disney favorite that cultivated a whole new kind of fanbase. With ‘Star of Something New,’ and ‘Breaking Free,’ the music created an OTP every loyal tween dedicated themselves to: Zanessa. Zac Efron and Vanessa Hudgens been broken up for almost nine years but we can always reminisce—it reminds us of simpler times. In 2009, Justin Bieber was just a fresh-faced baby singing ‘One Time.’ It’s hard to believe that a mere ten years ago—now he’s a married man and released a few no. 1 albums. While we wish Hailey Baldwin and Justin the best in their marriage, we can’t help but long for the days when ‘Baby’ was skyrocketing to the top of the charts.